Julia Buccola: The Italian Bride – new findings, photos, and podcast! Following a long research project, today I’ve published an article on The Order of the Good Death about Julia Buccola-Petta, the “Italian Bride” of Mt. Carmel cemetery. Most Chicago ghostlore fans know the basics: at Mt. Carmel stands a statue of a woman, Julia Buccola, in her wedding dress. 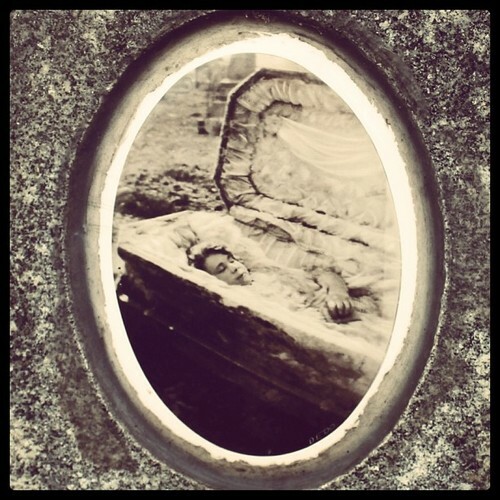 Beneath the life-sized edifice is a photograph of the Julia in her coffin. Though she appears not to have decomposed much, an inscription below states that the photo was taken when she had been dead for six years. Legend has it that her mother, Filomena, had nightmares in which Julia demanded that her body be disinterred, and, though there are various scientific explanations, some say the well-preserved state of her body is a sign of holiness. I’ve been researching the story heavily for the last few months, including conducting interviews with Filomena’s great grandchildren, who provided a few photographs that have never been in circulation before. Much of what I found came too late to be added to my new Ghosts of Chicago book, so I’m publishing it online, both here and in a new article for Caitlin Doughty’s Order of the Good Death. 1909 – Enrique (Henry) Buccola arrives in Chicago from Palermo Italy. 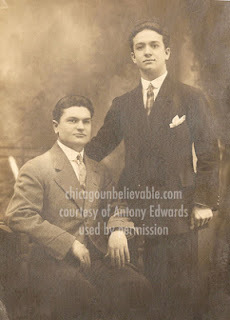 His brother Giuseppe (Joseph) appears to have already been in Chicago; his widowed mother Filomena and sisters, Rosalia and Guilia (Julia) remain in Palermo, Italy. Antony Edwards, used by permission. 1910 – According to the census, Henry is living in Chicago with Joseph Buccola and his wife Anna in Chicago (per the census). Henry is working as a tailor, Joseph is a designer. Both are going by the “Americanized” versions of their names in records. 1913/01/24 – a Sadie Lunetta is born to Mariano and Rosalia. She appears in some records as Lynn Sadie, and in most census forms under the name Rosaline. 1913/08 – Filomena Buccola, (Joseph, Henry and Rosalia’s mother), and Julia Buccola, (their sister), arrive in New York from Palermo en route to Chicago, where they’ll eventually move in with Henry in what is now the West Ukranian village. 1913/09 – The famous “Devil Baby” rumors swirl around Hull House. Filomena and Julia didn’t live in the Hull House neighborhood, but I’ve always liked to imagine that one of Filomena’s first acts as an American might have been to join the crowd of other old world women who went to Hull House demanding to see the (non-existant) devil baby. 1915/09/15 – Joseph Lunetta is born to Mariano and Rosalia. 1917 – Henry Buccola, working as a tailor and living on the 2200 block of W. Erie, lists Filomena as solely dependent upon him financially in a draft card. Julia presumably lives with them, as well. 1917 – Joseph’s draft card shows he’s working at the same place as Henry, though living a mile or two north. 1920, May – Julia is licensed to marry Matthew Petta. 1920, June 6 – Julia and Matthew marry at Holy Rosary Parish on Western Avenue (which still stands). They establish a home a couple of blocks away in an apartment building on West Huron Street, a block or two from Henry’s house (it, too, is still standing today). The apartment is pretty much in shouting distance of the house on Erie where Henry and Filomena are probably still living. 1921 – March 17 – Julia dies giving birth to a stillborn son, just over nine months after the wedding. Her funeral is held at Rago Brothers, next to the church, and she is buried at Mount Carmel Cemetery in Hillside two days later. 1922 – Joseph Buccola serves as witness to Mariano Lunetta’s naturalization as a U.S. citizen. 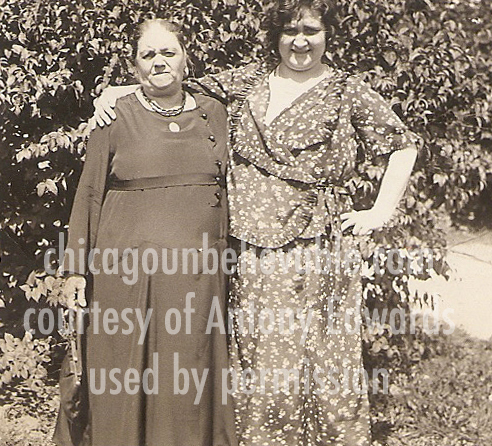 1923/04/08 Henry Buccola marries Anna Covolo in Chicago. Anna was born to Italian parents in Venezula and spoke Spanish. 1924 – Henry and Anna’s daughter, Flora, is born. 1925 (or so) – Matthew Petta, Julia’s bereaved husband, marries Margaret Collins, mother of a young boy named Eugene Miles. Eugene’s father is listed in the 1930 census a Missouri man; more info on him is unknown. Margaret is an Iowa woman of Irish descent. 1926/03 – Henry’s son Gaetano (“Guy”) is born in Chicago. Around this time, Henry and Joseph both move to Los Angeles, where the climate is closer to that of their native country. Filomena will spend the rest of her life going back and forth from Henry and Anna’s house in Los Angeles to Rosalia and Mariano’s in Chicago. She appears to have made the move with Henry and his family. 1926: According to the family, it was after the move to L.A. that Filomena began to have nightmares about Julia. The exact content of the nightmares is not known, though folklore in Chicago states that Julia was demanding to be dug up, or that Julie was still alive. 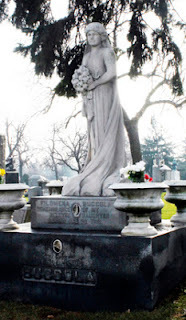 If nightmares weren’t involved, it may be that Filomena wanted Julia moved out of a Petta family plot (though there’s no evidence that she was ever buried in a spot other than her current one). In any case, Filomena begins to lobby for Julia to be disinterred. If this is really when the nightmares started, it was a fairly quick process. 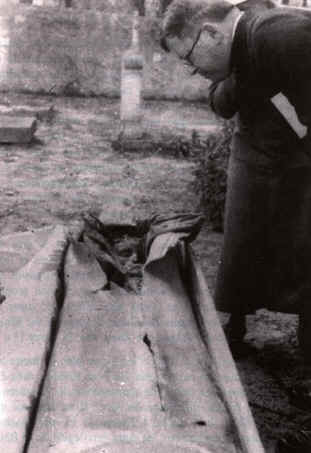 1927 – Julia is exhumed from her grave (at her brother Henry’s expense). Records do not indicate that she was moved; she seems to have be re-interred in the same plot. No primary sources or records regarding the circumstances of the exhumation have ever been uncovered, or of how in the world they got permission to do it, but a photo of Julia in her coffin is taken, establishing that it happened. Her face is still recognizable. 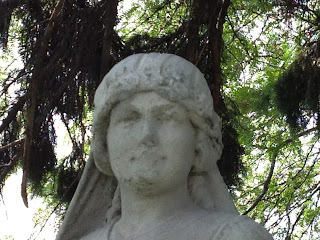 Notably, Julia’s married name, Julia Petta, appears nowhere on the monument. There is no record as to what the original monument (if any) looked like or said. The immense cost of the new monument (believed to be in the 10k range) creates a great deal of friction in the family – Henry Buccola’s wife is said to be furious, and Henry himself apparently isn’t happy about it, either. But the monument is built. No one knows now what the cost is, but family lore speaks of Henry lamenting that if they just had that ten thousand dollars, they’d be set for life. 1928: Flora, age 4, is unable to speak. A doctor says it’s merely confusion based on the fact that four languages are spoken in the house (English, Italian, Spanish, and Filomena’s thick Sicilian dialect). Anna, her mother, decrees that only English will be spoken in the house. Flora will eventually be able to understand Italian as an adult. 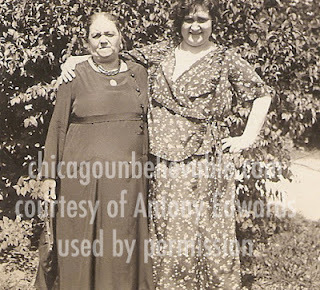 1930 – In the census, Filomena is listed as being back in Chicago, living with Rosalia and Mariano and their children, Rosaline (Lynn Sadie) Lunetta (17) and Joseph Lunetta (14). The same census shows Henry Buccola in Los Angeles with his wife and two children, Guy and Flora. He is now working as a designer for women’s clothing. Joseph Buccola is now in LA, as well, doing the same work. 1932 – Henry’s family (probably including Filomena) move into a new house in L.A. The family still owns the house today. 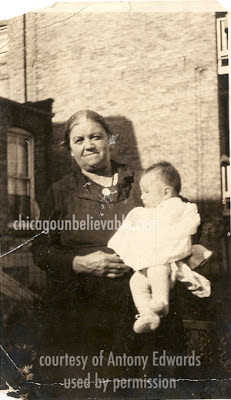 1934/06 – A son – with the same name as Julia’s stillborn child – is born to Matthew and Margaret Petta back in Chicago. in California. Courtesy of Antony Edwards. 1940 – The census states that Filomena is now living with Rosalia and Mariano in an apartment just around the corner from Julia’s old place. By now, Rosalia and Mariano’s daughter, Rosaline / Lynn Sadie is in Los Angeles. Matthew Petta is operating Matty’s Inn, a tavern, on Clark Street, near Division. He and Margaret also have an infant daughter (who passed away in 2013 while this article was being prepared). Eugene is 16 (his father is now listed as Matthew, not a missouri man), their other son is five. 1943/01/16 Mariano Lunetta dies at 61 – burial at Mt. Carmel. 1943/05 Lynn Sadie Lunetta, age 30, is licensed to wed Arthur Golluscio (b 1891) in Los Angeles. They are married 5 days later in a ceremony at which the officiant is a minister of the “Temple of Light Institution of the Masters.” Henry Buccola, her uncle, serves as a witness. 1944/09/23 – Henry Buccola dies in Los Angeles. 1945/03 – Rosalia Buccola-Lunetta dies in Chicago; Filomena moves in with Jospeh Buccola and his wife in Los Angeles. 1945/05 – Matthew Petta dies in Chicago, aged 55, and is buried at All Saints. His widow moves the children to Iowa. of Julia’s (space 5), at Mt. Carmel Cemetery. The Muscato family plot is between the two. 1945/10 Filomena dies in Los Angeles. 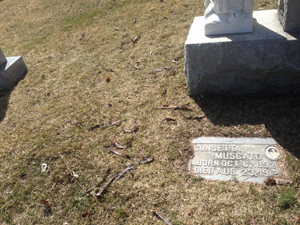 She is buried in Chicago, a few feet away from her daughter’s grave. Her space is unmarked, but only a few feet away from the massive monument that bears her full name twice. 2006 – Flora Buccola-Edwards, Julia’s niece and Filomena’s granddaughter, dies in Los Angeles, in the very house where she once shared a room with Filomena. Described in her obit as a “fierce liberal” and “staunchly pro-labor,” the family suggests donations to the United Farm Workers of America in lieu of flowers. note: I’ve left out a handful of exact dates, addresses, and the name of one person still living. 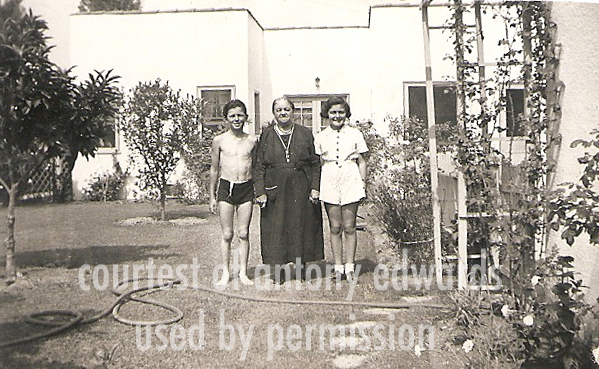 Note: I’m grateful for the family and children of Flora Buccola-Edwards for the photographs and information, especially Antony and Mariana Edwards. Again, for the full story, see the article on The Order of the Good Death. Who knows? Maybe it was as innocent someone was just creating some clip art or fan art of Jacinta and didn't know anyone would take it for a real thing. Or, then again, some people aren't above faking religious "evidence" now and then, for one reason or another. There's a whole world of "Biblical Archaeologists" out there who are making a lot of money by pretending to have found stuff they probably don't even believe in, personally. Sorry, couldn't correct the message but I mean the hairline is not the same but the locks and shadows are. Adam Selzer, I was considering the same and have compared some of Jacinta's pictures with the face in the second casket picture. It's the only explanation because everything else matches in the pictures. If a second picture was taken then at least some more changes should have been visible. About the hairline you mention, if her head was realy tilted the hair line would have changed also but it's exactly the same. I think this mystery is solved but it bothers me how and for what reason it was manipulated. Looking up some shots of Jacinta Marto when she was alive, it does look to me as though what's happened here is that someone has tried to use the Julia photo to create a fake Jacinta shot. One clue that it's not the same face is the amount of skin between the hairline and the right eye. I'll have to work up a post on this! Looking at the two side-by-side, it does seem to be exactly the same coffin. The folds, shaded areas, etc are all exactly the same when you flip it horizontally. So the question now becomes: is this a second photo of Julia, or a doctored version of the famous one? I'm leaning towards the latter, since one would assume that turning the head would cause some changes in the folds behind her head, and the "face" portion seems a bit clearer and sharper than the rest of the photo. Being as small as it is, though, it's hard to tell. Next step, again, is figuring out where that blog got the other photo! Yeah, that one looks a markedly less like the other shot. Next step is figuring out where they got that other picture, what the provenance on it is, etc. I'm not enough of a forensics expert to make a real judgement call here; a brief look makes me think the hair might be too light, and the shape of the head a bit off, for being Julia, but I wouldn't rule it out. Here is a picture of the exhumed body of Jacinta Marto that looks very different. Thanks, Boatswain! That does look pretty similar if you flip it, though I wouldn't say it was the same person without first looking more into the Jacinta photo (and any others of her that might be out there). The most obvious difference is the tilt of the head; I'd have to ask a mortician, but I'm not sure you could turn the head from one side to the other on a body like this without damaging it. Thanks for the update and info about Julia and her family. Would have liked to see another picture of Julia when she was alive but I guess they didn't have one. Did you know another picture of Julia in her casket excists? Found it on a site about incorruptible Jacinta Marto and they claim it's the exhumed body of Jacinta but when you 'flip' the image and compare it with the famous casket picture of Julia you will see it's the same woman. The hair strings above her head, the linen of the casket, the folds, just everything is the same. It's not the best quality and it's cropped and haven't found a better picture of it yet. Inside the Couch Tomb: Pictures!